I got hooked on The Jayhawks in 1992 with their country tinged album Hollywood Town Hall. For me they were the second coming of Gram Parsons. They pretty much defined alt-country and Americana. 1997’s Sound Of Lies introduced a pop sound that was more Beatlesque and less county. Since then the chief difference has been whether Mark Olson is involved or not (he departed prior Sound Of Lies but returned for thier last album – Mockingbird Time and subsequent tour). Olson tilts the band country and when he is not in the mix Gary Louris pop/rock aesthetics dominate. Frankly I love both versions of the band. Paging Mr. Proust finds them firmly on the pop side of the ledger (and naturally they are Olson-free). No matter what side of the ledger they are on you can always count on a few things: amazing harmonies, great Gary Louris guitar play, gorgeous lush arrangements and music that is deeply steeped in 60s and 70s pop without sounding retro or derivative. The Jayhawks, 30 years into their career have crafted a distinctive sound that is all their own (with or without Olson). “Quite Corners & Empty Spaces” opens the album in classic familiar Jayhawks territory. A shrewd move as the band invites us to put up our feet and get comfortable for what is to come. “Lost the Summer” adds the first twist. The band gives their sound a shot of Big Star. “Lovers of the Sun”has a glossy 60s pop sheen. A hipper version of The Association. The harmonies are golden. “Pretty Roses in Your Hair” continues with the 60s pop sheen, but it is quickly subverted by Neil Young/Crazy Horse rusty guitar solo by Louris. “Leaving the Monsters Behind” raises the Jayhawks’ freak flag a bit higher. The song is augmented by great R.E.M. harmonies. “Isabel’s Daughter”has has wonderful swirl to it. This sounds like a long-lost R.E.M. song – yet is pure Jayhawks. Side two opens with “Ace” – the most atypical Jayhawks’ song of their career. This is challenging noise rock that would not be out-of-place around Wilco’s and Neil Young’s weirdest moments. Not for the faint of heart but if you are willing to embrace it you will be rewarded. And then the classic Jayhawks’ sound is back with “The Devil Is in Her Eyes”. It sound even more Jayhawks-lush than normal given it follows “Ace.” This song is graced by one of Louris’ all-time great guitar solos. “Comeback Kids” is another nice evolution in the Jayhawks sound. “The Dust of Long-Dead Stars” sounds a little like Tom Petty, a little like the Grateful Dead, a little like R.E.M., but mostly like the Jayhawks. “Lies in Black & White” is an acoustic driven song, yet there is not anything folkie or country about. It has a great harmonica break. “I’ll Be Your Key”has a nice Big Star feel to it. 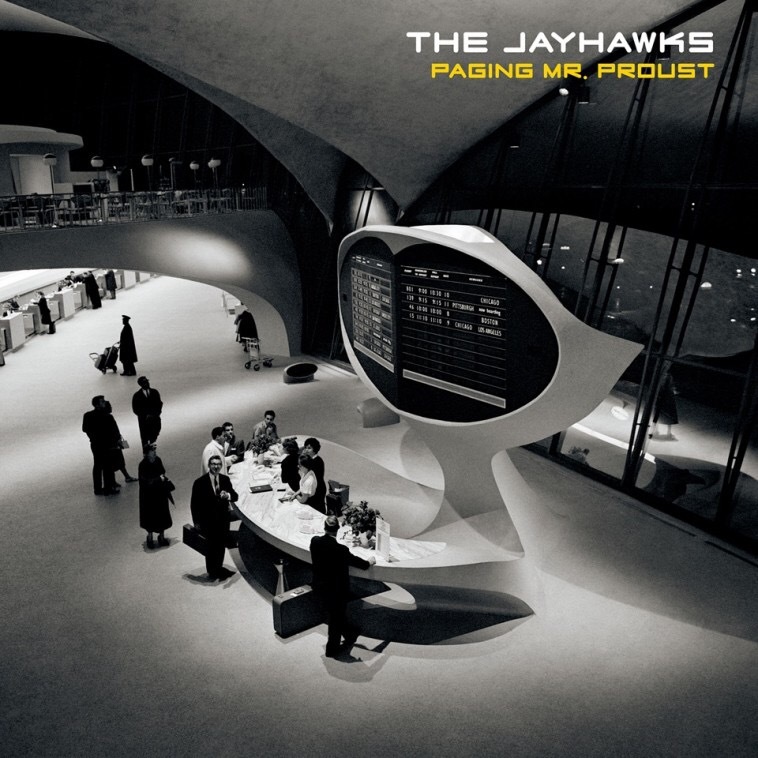 Overall I feel Paging Mr. Proust is the Jayhawks most adventurous and experimental album in their catalog. It feels like they have taken a cue from Wilco to just let their freak flag fly. Yet they are completely grounded in who they are. The transition seems like a natural progression and not some fad, imitation or pandering to the hip. This is a great album by itself and even more amazing 30 years into an established band’s career. A special shout-out to Karen Grotberg – her vocal harmonies are a key element to the unique sound and beauty of this album. Pete Buck sprinkles some of his R.E.M pixie dust on the album without overshadowing the Jayhawks personality. I am so proud of the band for not milking their legacy and instead reinventing themselves. To quote Dylan “That he not busy being born is busy dying.” The Jayhawks are busy being born.